Spring is finally here and hopefully I will get some more flying in. This blog has been pretty empty because of the bad winter weather we had here in Northern New Jersey. On top of the bad weather I have had too many busy weekends that also took away from available flying time. This past March I was fortunate enough to squeeze in a quick flight that deserves a blog post. On the surface, a 20min flight beginning and ending at my home airport would be a non event. 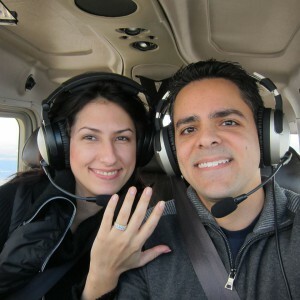 However on this flight I managed to propose to my girlfriend. I spent 3 hours the previous night making huge 7ft letters out of poster board and duct tape. The plan was to have my buddies lay out the letters on a baseball field in my hometown. I picked the field because it is near a huge cemetery and easy to spot from the air. I would then just fly over it, girlfriend would read it, and voila proposal complete. The wind however disagreed with this simple plan. After waking up that morning and checking the METARs/TAFs I was contemplating calling it off. While the wind was mostly down the runway it was gusting a lot and was going to make it pretty bumpy up there. It was still within my personal limits so I decided to not scrub the flight and check once again after driving to the airport. I received the ‘all clear’ text message from my ground crew that the sign was setup and ready to go. After hopping in the plane we lined up and took off. It was gusting quite a bit and I immediately realized this might make today more interesting than I had planned. The baseball field is only about a 10min flight from my home airport. As I approached the field and told my girlfriend to look I noticed that there was quite a problem on the ground. Apparently just minutes before I flew overhead the wind completely blew all of the letters all over the field. The guys were scrambling around to try and fix everything. Instead of it saying ‘Marry me, Anca?’ it just looked like the local fire department was practicing some sort of disaster exercise with red stretchers. I started laughing and basically had to make her guess what it ‘might’ have said. After a few seconds she figured it out and started cracking up too. The whole time she just thought this was a typical $100 hamburger flight. After all of the laughing and crying was over I was able to get an audible ‘Yes’ out of her. After circling around a few times the guys managed to fix some letters but wind picked up even more and I decided flight needed to come to an end. I made a decent landing back at MMU runway 23 and the rest is history. I was recently searching for a list of flying clubs in my area and found a few websites. Most of the websites had old outdated information and a bunch of dead links. One of the most useful I have found is by MyFBO.com. They maintain a list of non-profit clubs across the country. My only problem with this site was lack of control over the listings. Changing a listing requires emailing myfbo and waiting for the change to be made. The site also lacks searching ability and detailed info on each club. So in my spare time I decided to construct a free to use website for listing non-profit flying clubs across the country. It is in its infancy right now and to be honest pretty slow, but the basic premise is there. Anyone can create a listing and edit it. I then check the listing for errors or bad links and approve the changes. It also shows how many planes the club has and some information on the club. Check it out sometime and let me know what you think. I will be improving it as soon as I have some spare time. 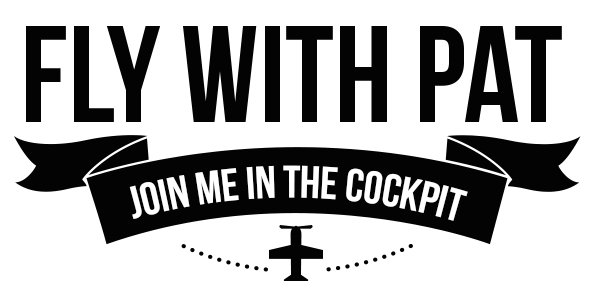 UPDATE: As a result of the successful AOPA Flying Club initiative I have decided to spend my time on other things and have shut this site down. Please go here if you are looking for flying clubs. Once I passed my checkride I was looking forward to reading for fun rather than studying. I went on Amazon.com and found a few great books about flying adventures. One of the books I picked up was Flight of Passage: A Memoir by Rinker Buck . It is about two boys from N.J. who fly a Piper Cub across the U.S. in 1966. The books is actually written by one of the boys. It chronicles their great adventure all the way from refurbishing the airplane to their landing in California. I really enjoyed the book and read it almost non-stop. Buck has the great ability to put you there along for the ride inside the cockpit. I felt like I could relate to it a bit because I would like to get my tailwheel endorsement and am also from New Jersey. If there is one lesson you should take away from this book it is “Don’t forget the waterbag”! If slow and low is your thing or if you are just looking for a great adventure pick up a copy, you will not be disappointed. While I was reading news I came across an article about a teenager from Maryland who was so inspired by this book he is going to fly solo coast to coast. I wish Nate Foster the best of luck and I am sure it will be quite the adventure. Check out the article here.